This is one of the most ancient breeds of dog to originate in France. They are big, solid dogs that were initially used for hunting large animals such as wild boars and guarding homes and cattle. Unlike other French breeds, the Dogue de Bordeaux was relatively unknown outside their homeland until the middle of the 19th century and is now steadily growing in popularity. This large dog can live up to six to ten years of age. Trained and brought up correctly the Dogue de Bordeaux is a gentle giant. Like many large dogs, this breed loves human company but, due to their imposing bulk, should be closely supervised around children and the elderly to discourage jumping up. Biting and jumping should be discouraged from an early age as this type of behaviour stops being cute when they are fully grown! 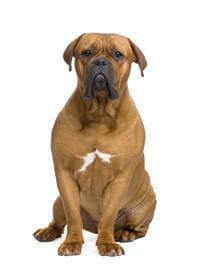 The Dogue de Bordeaux is a loyal and trustworthy breed that also makes an excellent guard dog. Being a large breed, the Dogue de Bordeaux has a tendency to dominate other pets around the home and is best kept on its own or with its own kind. Big dogs need big space, so potential owners should consider the size of their home and their lifestyle before bringing one of these gentle giants into their lives. Although not an overly active dog, daily walking on a strong lead is essential for adult dogs to maintain their condition and exercise. Growing puppies should be allowed to finish developing before they are given too much exercise and should be given plenty of time to rest between bouts of play. Big dogs like the Dogue de Bordeaux are not for everyone, but those who choose to bring one into their home must be sure they can handle a big dog and be prepared to exercise it regularly. Those who are prepared to put in the hard work with this dog will certainly be rewarded with a devoted and affectionate companion.